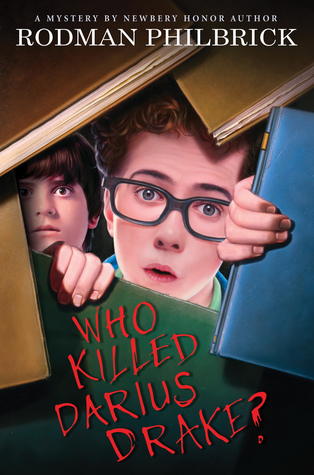 Ms. Yingling Reads: Who Killed Darius Drake? Philbrick, Rodman. Who Killed Darius Drake? Arthur Bash is a big kid who will menace anyone for a candy bar. He's used to protecting others from the annoying, geeky Darius Drake, so he's surprised when Darius wants to hire him. There's a spooky house by the Stompanado housing development on Rutgers Road, and Darius has gotten a message, written in blood, from that address. It reads "Who killed Darius Drake?" He wants Arthur's back up to investigate. When the boys go into the house, they meet Vincent Meeks, a threatening ex con whose childhood accident has earned him the nickname Scar Man. Eventually, the boys find out that there is a big mystery to be unraveled that involves Darius' grandfather, the long lost Dunbar Diamonds, and Jasper Jones, who lost money to Darius's grandfather. Arthur's step sister Deidre figures early on that the cryptic note refers to the fact that Darius almost died in the car accident that killed both of his parents, and this is the key to many of the clues. Strengths: After a somewhat rocky start, I really enjoyed this, and the variety of clues and mysteries kept me turning the pages. Arthur was an intriguing character, and his family problems were realistic. Deidre was a great and supportive step sister. Darius's background was interesting, and the creepy old house was cool, even if Arthur was afraid that the floors would cave in! What I really think: This was a solid story that might take a little hand selling. It's good that it looks like a murder mystery, because my students often ask for those. Not a lot of writers think murder is a good topic for a book for 12-year-olds! Jean Huddy is finally old enough to eat the sacred bear liver that keeps the adult citizens of St. Polonius-by-the-Fjord from falling into a deep sleep. When it makes her sick, her mother refuses to report her, feeling that the tradition, while important, is really rather silly. Of course, the adults in the town DO fall asleep, and the children must band together to keep the town going while they try to solve the mystery and find an antidote for their parents. 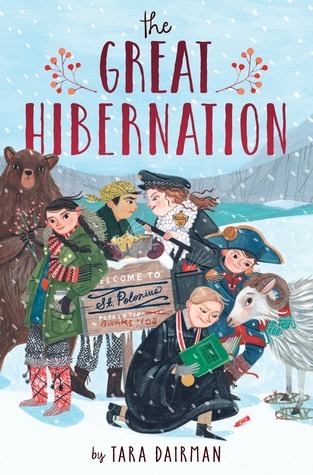 Strengths: While this is not a traditional fantasy book, I think I would have to class it in speculative fiction, since the adults do fall into hibernation. The world building is quite complete, although I am not entirely sure where the town is located. This had a Lemony Snicket meets Gilligan's Island sort of vibe-- children having to survive on their own. The sub plot about bringing more technology to the town was interesting. Weaknesses: Very quirky. While I can see strong 3rd and 4th grade readers thinking this is the best book ever, I don't see my middle school students getting past the whole eating the liver thing. What I really think: I adore, adore, adore this author's All Four Stars series, but I think I will pass on purchasing this one. The cover is too similar to Bo at Ballard Creek, which does not check out even though I love it.